It’s time for one final push in party planning. After the last bit of wrapping paper has been thrown out and the Christmas left-overs finished up, it’s time to ring in 2015 with a New Year’s Eve bash! It’s the perfect time to be as festive as you can. Get a Late Start: Small bites you can prepare ahead of time will help keep guests entertained and keep you out of the kitchen to enjoy the party. Serving dinner later in the evening will make midnight seem closer than you think! Keep it simple with cheese platters, shrimp cocktail, crackers and dip; tea sandwiches and bacon wrapped scallops (recipe below) just to name a few. When in doubt…pop some frozen hors d’oeuvres in the oven! Have Enough to Feed a Crowd: There’s nothing worse than running out of food before the clock strikes twelve. For your party, follow these general rules to make sure everyone leaves satisfied. For meat, you can feed 25 to 30 people with a 15-18 pound Turkey, 6-7 pound boneless ham, or a 12-pound roast beef. Pasta is a crowd pleaser! For pasta, calculate about two ounces (dry) per person if it’s being served as a side dish. If pasta is your main, figure about four ounces per person. It will be plenty when you consider appetizers and side dishes. Toast to the New Year: It’s New Year’s Eve, what’s a party without some festive drinks and cocktails? Don’t weigh yourself down with heavy drinks, instead serve a light Sangria and have alcohol-free alternatives such as fruit-infused punch or portion-controlled options like Coca-Cola Mini cans which come in a variety of flavors including Coke, Diet Coke and Coke Zero. Another option I love is Coca-Cola Life, a new reduced calorie cola that comes in the iconic 8oz glass bottle. Create Lasting Memories When the Ball Drops: There are many traditions around the world that serve different foods or drinks when the ball is about to drop. In my family, we eat grapes as we count down from 12 to Happy New Year; we make a wish for each grape we eat. Gather your guests to create a new tradition as the clocks strikes midnight that will make lasting memories throughout 2015. 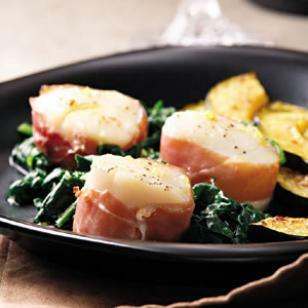 Here we wrap plump and juicy scallops in a bit of mellow prosciutto for a more sophisticated take on bacon-wrapped scallops. Use a better-quality prosciutto for superior flavor—it may cost a bit more, but you only need a small amount for this dish. Pat scallops dry and sprinkle both sides with lemon pepper. Wrap one strip of prosciutto around each scallop. Thread the scallops onto toothpicks (or skewers), securing the prosciutto to the scallop, and place on the prepared baking sheet. Meanwhile, whisk oil, lemon zest, lemon juice, salt and pepper in a small bowl. Serve the scallops drizzled with the vinaigrette. Make Ahead Tip: Prepare through step 2. Cover and refrigerate for up to 4 hours. Ingredient note: Be sure to buy “dry” sea scallops (scallops that have not been treated with sodium tripolyphosphate, or STP). Scallops that have been treated with STP (“wet” scallops) have been subjected to a chemical bath and are not only mushy and less flavorful, but will not brown properly. Jacqueline Gomes is a Registered Dietitian whose experience includes counseling, community and media relations, marketing, public speaking, sports nutrition and nutrition research. In addition to being Registered Dietitian for Foodtown supermarkets she is a consultant to food and beverage companies including Coca-Cola.